The genus Coelogyne comprises over 200 species distributed throughout many Southeast Asian countries at elevations ranging from sea level to almost 4000 m. Those found near sea level obviously need intermediate or warm cultural conditions but there are quite a few species found at altitudes above 1500 m that can be grown under shade-house conditions in Melbourne and elsewhere. They grow and flower even better if provided with ‘cosy’ quarters in which a fibreglass roof protects them from winter rains and the occasional frost. 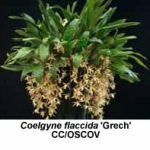 Virtually every orchid grower in southern Australia is familiar with Coelogyne cristata, which is one of the first species that cymbidium growers in those regions acquire when seeking to broaden their orchid collections. It needs cold winter nights to induce flowering and some growers in northern New South Wales and Queensland therefore find it hard to flower. Coelogyne cristata is native to the Indian Himalayas, where it’s usually found at altitudes between 1700 and 2300 m. The pendant inflorescences can bear up to ten brilliant white flowers measuring 75-80 mm across. The lip is marked orange yellow and bears several orange-yellow keels. There is an all-white alba form (also known as var. hololeuca) and a var. lemoniana in which the keels are lemon-yellow. In contrast to Coelogyne cristata, which is reasonably widespread throughout the eastern Himalayas, Coelogyne mooreana is found only in Vietnam. Wilhelm Micholitz, working for the famous British nursery of Sander and Sons, was the first European to collect this species (in 1904). 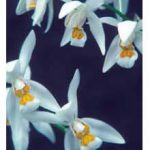 When first flowered in Britain two years later it caused a sensation and has been in demand by orchid growers ever since. Most attempts to propagate it from seed are unsuccessful but occasionally seedlings become available. Many of the plants that appear on the market are probably divisions of existing plants. Whereas the inflorescences of Coelogyne cristata emerge from the base of the recently matured pseudo-bulbs, those of Coelogyne mooreana develop from the centre of the new growths and both the pseudo-bulb and its inflorescence mature together. In contrast to the arching flowering stems of Coelogyne cristata, those of Coelogyne mooreana are more upright. 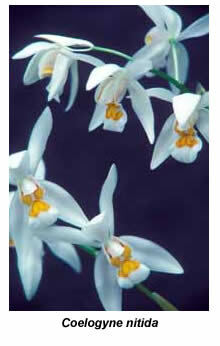 They carry about ten flowers of a glistening white colour, apart from orange markings and hairs on the basal half of the labellum. The most highly prized cultivar is ‘William Brockhurst’, which has broader segments than other cultivars and a slightly drooping dorsal sepal. Coelogyne mooreana produces new growths intermittently throughout the year (less frequently during winter) and consequently it may flower several times a year as each of its new growths mature. 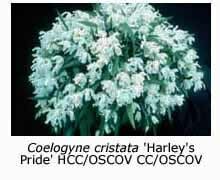 While some may consider this behaviour to be an advantage, it means that this species is less likely to produce such a magnificent flowering display as Coelogyne cristata, which produces its blooms simultaneously (but only once each year) in spring. 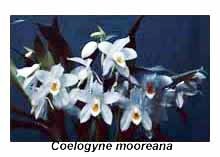 Nevertheless, if I were forced to make a choice between the two, I would settle for Coelogyne mooreana. After Coelogyne cristata, the most commonly cultivated coelogyne species in Victoria is probably Coelogyne flaccida. Although also a native of the eastern Himalayas, it is found at lower altitudes (1000-1700 m) than Coelogyne cristata and, in my opinion, is a marginal candidate for shade-house cultivation in Victoria. Both its plant and flowers are smaller than those of the above two species. The cream flowers, up to nine per pendant inflorescence, measure 20-30 mm across. Coelogyne ovalis and Coelogyne fimbriata are also reasonably common in Victoria. If left undisturbed they multiply into large specimen plants in as little as five years. Although they may begin life as pot plants, they quickly spread beyond the confines of the pot until eventually it is completely concealed. At this stage virtually all the roots are aerial. Both species produce 1-3 small cream to tan-coloured flowers with darker brown lips; they emerge from the apex of the most recent pseudo-bulbs during autumn or winter. There is a view that these two species (and Coelogyne fuliginosa) are variants of a single species, and that all should be given the name of the first described, namely, Coelogyne fimbriata. Another species that also grows well for me under shade-house conditions is Coelogyne carinata. Its flowers are similar in shape and colour to those of the three previously mentioned species but are somewhat larger. Coelogyne lactea, a native of Thailand, Burma, Laos and Vietnam, is a smaller growing species also suitable for cool climates. Its horizontal inflorescence carries up to ten small flowers that, as the species epithet suggests, are creamy white in colour. Two less-commonly seen but highly attractive species that should grow happily under shade-house conditions in cool climates (particularly Tasmania) are Coelogyne nitida (formerly well known in Australian collections as C. ochracea) and Coelogyne corymbosa. The latter grows in the Himalayas at altitudes between 2000 and 3000 m and it is therefore more likely to suffer from the heat during hot spells in summer than from cold in winter. For that reason I grow it in my glasshouse, where an evaporative cooler keeps summer temperatures below 30˚C. Its two to four glistening white flowers, about 60 mm across, have lips that are strikingly marked with yellow blotches outlined with orange-red. The flowers of Coelogyne ochracea are also white with a strikingly marked labellum but unfortunately I find this species hard to flower. Neither of my plants has flowered for several years, even though one is grown in a shade-house and the other in a heated glasshouse. 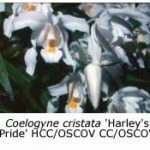 Although a considerable number of coelogyne hybrids have been registered over the years, only a few are suitable for shade-house cultivation in southern Australia. By far the most commonly grown in Melbourne is Coelogyne Unchained Melody, which is identical with a jungle-collected plant imported from India many years ago under the name Coelogyne cristata var. intermedia. A primary hybrid between Coelogyne cristata and Coelogyne flaccida, it shows good hybrid vigour and soon develops into a specimen plant. The white flowers, intermediate in size between those of its parents, are produced on arching inflorescences from the base of the latest pseudo-bulbs. Another hybrid that is becoming increasingly common in Victoria is Coelogyne Linda Buckley, a primary hybrid between Coelogyne cristata and Coelogyne mooreana. Its glistening white flowers show characteristics intermediate between the two parents, although the inflorescence itself takes after Coelogyne mooreana in that it emerges from the centre of the new growth, rather from the base of the pseudo-bulb. This hybrid was made by the late Ron Pearce, a highly respected Victorian orchid grower, and is fairly widespread among Melbourne growers. Unfortunately Ron was beaten by a few weeks in registering his preferred name for this attractive hybrid. 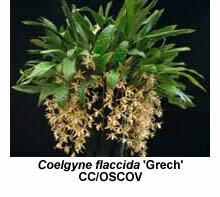 Ron also created Coelogyne Edward Pearce (C. fragrans x C. mooreana). Coelogyne Jannine Banks (C. flaccida x C. mooreana) and C. Amber (C. speciosa x C. ovalis) may also grow under shade-house conditions in Victoria. Most if not all of the above coelogyne species originate from monsoon regions where they experience hot, extremely wet conditions for part of the year, followed by a cooler, relatively dry season. During the wet season they usually receive at least 25 mm of rain every day, sometimes considerably more. Coelogynes should therefore be watered frequently during summer – I usually water my plants on every sunny day. Frequent applications of liquid fertiliser are also recommended while the plants are in growth. Some growers withhold water completely while the plants are resting during winter but I do not recommend this practice, and water my plants once every week or two at this time. I find that coelogynes grow better if potted in a pine bark mix containing a little chopped Sphagnum moss, which helps to retain moisture. Those plants with arching or pendulous inflorescences, such as Coelogyne cristata, should either be grown in hanging baskets or their pots suspended using pot hangers. Preferably all should be grown in a shade-house fitted with a fibreglass roof so that the amount of water they receive during winter can be strictly controlled. Care should be taken not to wet the flowers of white-flowered coelogynes, as they may develop unsightly brown markings. The flowers of Coelogyne cristata, in particular, may be ruined within a few days after a single drenching. If kept dry, they remain in good condition for at least four weeks. 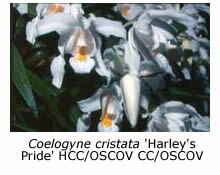 In common with most species in the genus, Coelogyne cristata has relatively few roots. In fact the most recent growths (those younger than two or three years) usually have none! It is very important when making divisions to ensure that each piece has several roots and that it is potted in a water-retentive medium such a Sphagnum moss. Divisions potted in moss soon become established and start to grow. However, if planted in an open medium, such as pine bark, their pseudo-bulbs may shrivel and then take a year or two to regain their original plump condition and resume normal growth. These remarks also apply to most other coelogyne species and hybrids. 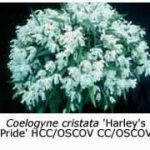 As far as pests and diseases are concerned, the main problems that my coelogynes experience are aphids attacking the developing inflorescences and rot in the occasional new growth. Most new growths develop as funnels, which collect and retain water if the plants are watered overhead. Care should be taken to avoid filling these new growths with water until they have hardened off. The backs of the leaves of some of my coelogynes, especially Coelogyne tomentosa and Coelogyne Unchained Melody, are prone to fungal attack, and occasionally develop rust-like markings. I now spray these plants with a fungicide occasionally to prevent a recurrence of this unsightly infection. 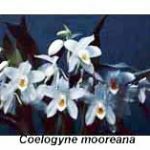 When asked by new growers to recommend coelogynes for shade-house culture, I usually suggest that they begin with Coelogyne cristata,Coelogyne mooreana and the hybrid Coelogyne Unchained Melody. The first will be easy to find on orchid society sales benches but you may have to hunt around for the other two. All three will make happy companion plants for your cymbidiums.